Be prepared by adding an extra blade to your order. Blades dull the more they are used, or can be damaged by misuse. Having an extra blade means that you don't have to hault production to wait for your order of a new one. Simply change the blade and continue work. All replacement blades can be purchased separately on our site. Dahle's professional series of rolling trimmers are designed for heavy duty applications where precision is essential. These trimmers are equipped with a ground self-sharpening blade that cuts in either direction. Most models in this series have a cutting capacity of up to 20 sheets of paper at a time and are perfect for cutting paper, trimming photographs, and large format printing. These trimmers can be wall mounted and the two larger sizes have optional floor stands. Dahle Professional Rolling Trimmers are available in 14", 20", 28", 37" and 51" cutting lengths and are a popular choice among professional photographers, print shops and graphic design agencies. Just received our trimmer today. Looks really nice, did some test runs and it works very well. I am interested to see how well it hold up considering some of the pieces are plastic. So far we really like it! I can think of only two things that could make this product even better: if it had a backlight and if if the width was greater for ease of measuring and cutting tabloid size - 11"x17" - papers. (There may be another Dahle product that is wider; I haven't checked.) Nevertheless, this cutter works great! I'm so glad we bought this one and not one of the flimsier products on the market. Pros: This is the best trimmer I have EVER had! And I'm a little of a connoisseur. Our 220gsm paper stood NOO chance! Bam, it was sliced. Complete BEAST of a trimmer. This thing could cut sheet iron. Even the French would be proud of such a quality guillotine. Pros: An excellent replacement for our 30+ year old previous Dahle trimmer.Trims beautifully and has many guide lines which is useful when trimming multiple wadges of paper. Welcome to MyBinding video. 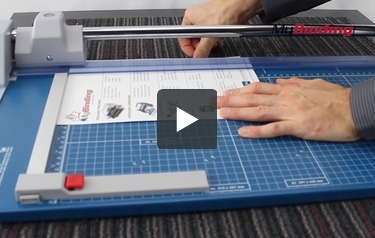 This video looks at the Dahle 552, a professional grade rolling trimmer. If you own a Dahle already, you know just how great a product it is. Solid, lightweight, durable, with plenty of measurements, this machine is built to last. And there's the convenience of built-in wall and table mounts. 31 centimeters or 20 1/8", this rolling trimmer can handle the largest of jobs. Paper, cardstocks, laminates, you name it, it can handle it. And as with all rolling trimmers, it could trim in both directions. The Dahle 552 can handle up to 20 sheets of 20 pound paper in a single trim. I thought it would be harder but I was surprised at the lack of resistance. The automatic paper clamp is both built-in safety and holds your projects in place. And the self sharpening blade is nice and tucked away in a protective housing. The entire metallic work surface is one large measuring grid for both straight and angled cuts. Dahle makes fantastic durable equipment with great precision. The 552 is no exception. For more demos, reviews, and how-to's, check out MyBinding.com. A high-quality rotary trimmer is a great cutting tool to have around and one of the best is the Dahle 552. Here are its strengths and weaknesses for you to check out if you’ve been looking for a good rolling trimmer. Rolling trimmers can sometimes be capable of only trimming a few sheets of paper at a time. However, that’s not the case with the 552. This device can train as many as 20 sheets at once, so it’s a good choice if you need something with a decent cutting capacity. The 552 is also great to use if you need to work with big pieces of paper. It has a 20-1/8” cutting length so you’ll be able to trim both large and small items. This is an especially good length if you’re working with banners, posters, and so on. This trimmer has a blade that’s able to cut no matter which direction it’s going in. The blade is made from ground steel and it can sharpen itself so you don’t need to change blades even after a lot of use. Also, the blade enclosed in plastic casing so your fingers won’t get too close to it. This helps prevent injuries. You can work with both sheets and rolls of paper with this device. If you choose to use rolls, there’s an optional roll holder that attaches to this trimmer. The 552’s base is made out of metal so you don’t have to worry about it warping or becoming cracked, unlike wood. The base has an alignment grid with both metric and standard measurements. Your documents will stay in place when you cut them thanks to the trimmer’s automatic paper clamp. Finally, this product comes with a limited lifetime warranty for your peace of mind. This trimmer measures 27-3/4” x 14-18/” so it’s pretty large. Unfortunately, it doesn’t come with a floor stand like the Dahle 556 and 558 cutters, so make sure you have enough room for it or you’re comfortable with hanging it on a wall. Finally, the 552 is a very bright blue color that may not appeal to some people. Conclusion: The Dahle 552 has many more strengths than weaknesses, making it a good choice for just about anybody. It has a good cutting capacity, can process larger pieces of paper, and is made out of high-quality materials. This trimmer is also safe to use and it can be mounted on a wall for convenience. So unless its size and color are off-putting, you’ll want to check out the 552 today. Does this cutter cut chipboard? Thank you for your question. While rotary trimmers are able to cut thinner card stock, it is not recommended for volume. Chipboard is a dense material and will tend to dull the blades faster than paper and lighter card stock.Heavy duty guillotine and stack cutters are better suited for cutting chipboard. You can find those here . Is there a perforating blade that can be used with the 552? Unfortunately the 552 does not have a perforating blade that can be used with it. However Dahle does make he 507K which does offer a perforating blade as an option.